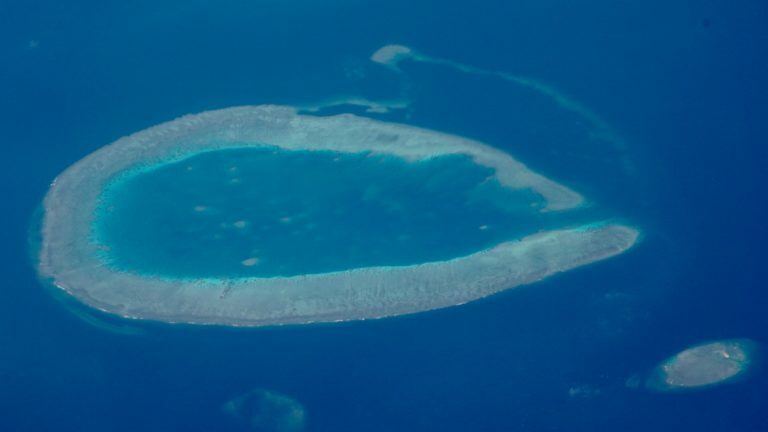 An aerial view of an Australian island which is part of the Great Barrier Reef. Photos taken overhead are compared with readings under the water by scientists. Photo courtesy of Bob Carpenter. The National Aeronautics and Space Administration (NASA) is known for its in-depth work in space exploration and research. But space is not its final frontier. CSUN CORAL technician Sam Ginther, left, works alongside professor Bob Carpenter, right, to put a measurement tool at a coral reef site in Australia. Photo provided by Bob Carbenter. California State University, Northridge marine biology professor Bob Carpenter is among a team of 20 international researchers and engineers who are taking NASA on a voyage to the depths of the ocean as part of a $15 million, three-year project to go where no NASA technology has gone before. Carpenter explained the project, known as the Coral Reef Airborne Laboratory (CORAL), could have momentous effects on the way Earth’s oceans are explored in the future. CORAL uses spectrometers created by the Jet Propulsion Laboratory (JPL) in Pasadena that are generally used on the Mars Rovers. 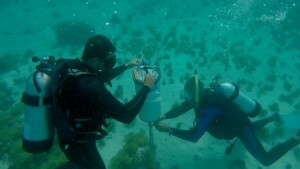 Spectrometers are placed on a plane to take aerial photos of the reefs while a dozen scientists are scuba diving at the same location and making measurements of the coral ecosystems. Carpenter explained the project is expected to provide more coverage of coral reefs than any other project he has ever done. The team recently returned from its first of four campaigns in the Pacific Ocean — the Great Barrier Reef. Carpenter and his two team members from CSUN, postdoctoral researcher Chiara Pisapia and technician Sam Ginther, placed instruments which measure water flow, calcification and oxygen of the corals, at reefs on both the north and south ends of the GBR. Pisapia said one of the biggest benefits of the project will be an understanding of how to better protect coral reefs in a changing global climate. The logo of NASA’s international collaboration effort, Coral Reef Airborne Laboratory. Image provided by Bob Carpenter. Ginther said the best part of the project is working alongside researchers from a variety of disciplines. The next campaign begins in February at the Hawai’i Institute of Marine Biology. Carpenter said if NASA approves the results of the first four campaigns, the project could receive additional funding to research reefs beyond the Pacific, and possibly have the spectrometer placed on a satellite instead of a plane. For now, project CORAL is providing scientists from countries including Australia, Italy and the United States with the opportunity of a lifetime.